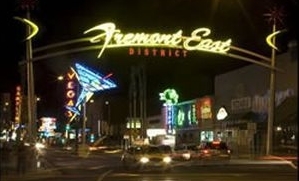 In late August 2007, the city of Las Vegas completed a $5.5 million streetscape effort for downtown's new entertainment district, Fremont East. These streetscape improvements were made possible through a public-private partnership by the city of Las Vegas and Fremont East property owners. Located in the heart of downtown, the Fremont East District sits adjacent to the popular tourist attraction called Fremont Street Experience, which was visited by 18.7 million people last year. Improvements made included the creation of wider sidewalks and more pedestrian-friendly streets; landscaping; lighted gateways and four 40-foot-tall, retro-looking neon signs. Through this streetscape effort, the city is capitalizing on popular nostalgia by reviving the old glamour of vintage Las Vegas. From Las Vegas Boulevard to Eighth Street, three blocks of Fremont Street experienced this transformation. Streetscape improvements were begun in late January 2007 and took seven months to complete. Backstage Bar & Billiards - 601 Fremont St.
Apr 27 Sat Sekta Core Los Ataskados, Muertos Heist, Better Broken 8:00pm Tickets $10.00 +tax & fee. Apr 29 Mon Sourvein 16, Life's Torment, Plague Doctor 8:00pm Tickets $10.00 +tax & fee. Downtown Cocktail Room - 111 Las Vegas Blvd. The Griffin - 511 Fremont St.
Take 1 Nightclub - 707 Fremont St.